Any motorcycle capable of lapping the Isle of Man TT course at over 117 mph has got to be special. When the machine in question is a standard roadster, complete with lights, generator and pillion seat, and has since benefited from a further five years of development, it is clearly very special indeed. This is just part of the pedigree of Yamaha’s stunning FZR 1000. The big four began life in 1987, immediately capturing the imagination of the motorcycling public and becoming a best seller. In 1989 it received an extra dose of desirability with the arrival of the EXUP version, and then reveled in a further revamp for ‘94’. Throughout it has enjoyed substantially the same ‘Genesis’ engine technology: a liquid cooled four with dual overhead camshafts and no fewer than five (three inlet, two exhaust) valves per cylinder. Long gone are the days when the Japan built superb engines which utterly outclassed their chassis. Tying the FZR together is huge aluminium ‘Deltabox’ frame, stiff as a bridge but infinitely lighter. A huge aluminium swing arm is similarly rigid. The latest versions of the FZR were ultra stiff Ohlins ‘upside-down’ front forks, and a high specifications rear monoshock. Both are adjustable for spring pre load and damping to suit different riding styles and conditions. By the mid eighties, motorcycle design had come a long way. 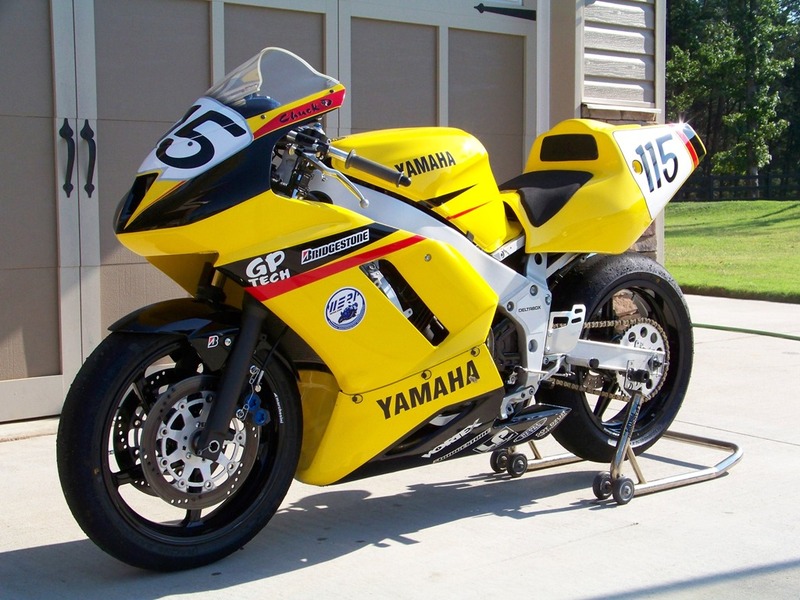 From the early, over-powered and ill handling Japanese superbikes, had evolved machines which took their cues from the racetrack and had tyers, suspension and steering to match. Suzuki’s GSX-R750 and Yamaha’s FZ750 typified the new breed. But there will always be those who are less concerned with all around performance than with sheer, brute power and thrill of violent standing start acceleration. The Yamaha V-Max was designed just for them. When it was first introduced in 1985, the V-Max caused a sensation, as much for its styling as its potential performance. The high speed barred, low slung look was based on the American cruiser style bikes made for showing off an illegal sprints on impromptu drag strips on public roads. 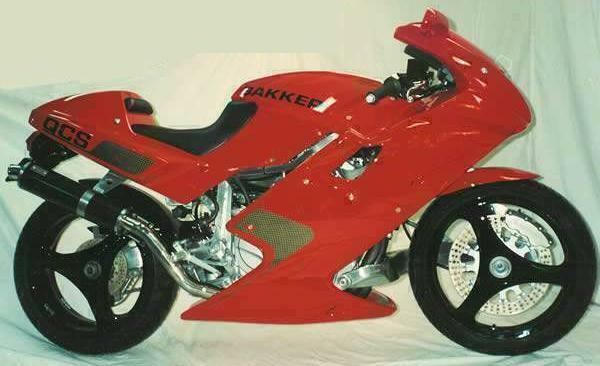 Real drag bikes had already evolved into long wheelbased, front heavy machines designed specifically for speed. Cruiser style puts the emphasis on looking fast, lots of noise and ability to leave long strips of burnt rubber off the start line are more important than actual times. The V-Max is completely dominated by its engine. At the time its V-four layout was a high tech departure from the in line fours that powered most Japanese motorcycles. It featured a novel carburetor arrangement which meant each cylinder was fed by two carburetors, and then a gate moved to allow those same two carburetors to fill a different cylinder, thus eliminating the ‘dead’ time that usually occurs during a bike’s combustion cycle. And once on the move, the slightly lumpy power delivery, and the sheer amount of power it delivers – distract attention from the bike’s handling. When it comes to bringing technological innovation to mass produced motorcycles, Yamaha leads the way with its revolutionary GTS 1000. The GTS was the first mass production Superbike of the present age to use a front suspension system that didn’t employ a couple of telescopic forks and a chassis that doesn’t run more or less in a straight line from the steering head to the swingarm pivot. Motorcycle manufactures have long searched for a method of suspending the front wheel of a motorcycle that doesn’t rely on conventional telescopic forks. ‘Teles’ are unsatisfactory for several reason, they are prone to flexing under braking and when corning, and then cause the front end of the bike to ‘dive’ under braking. The search for a realistic alternative has been the Holy Grail of motorcycle engineering. Yamaha’s alternative front end, as featured on the GTS 1000, in a solitary sided front swingarm with hub-centre navigating not unlike one front wheel of a car. Separating the steering purpose from the suspension should, in theory, produce a bike that steers, corners and brakes better than a bike with conventional forks. The GTS’s Omega chassis is different from that of a conventional bike because the front suspension removes the necessity for a headstock. The aluminium alloy frame is a squat box shaped affair which wraps around the engine, on to which are bolted the front and rear suspension systems, as well as the sub-frames necessary for the steering, seat and bodywork. The result is a bike that has most sophisticated front suspension systems in production. The bad news is that, in the case of the GTS at least, this kind of suspension system offers no significant improvement over conventional telescopic forks. Being designed as a sports touring motorcycle the GTS is too long and carries too much weight to reap any benefits from the hub-centre steering other than the elimination of the front end drive under braking. When Yamaha decided to enter the retro-bike market with a big, unfaired four-cylinder roadster, the perfect powerplant was already close to hand. The FJ1200 sports-tourer had been hugely popular for years due largely to its superbly tractable air cooled, 16-valve engine. This faith brute of a motor was detuned, its cylinder fin-tips were polished, and it was put on display at the heart of twin-shock musclebike called the XJR1200. 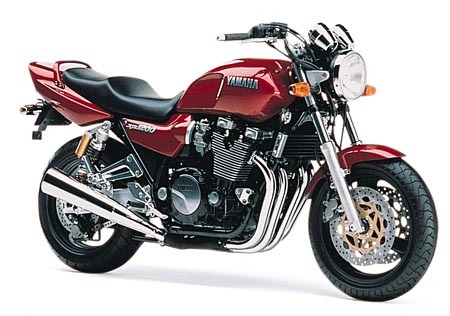 Yamaha lacked the four-stroke tradition of Kawasaki and Honda, whose Zephyr and CB1000 models the XJR, was created to challenge. But the new bike’s lines contained a hint of the 1978-model XS1100 four, and its all-black color scheme echoed that of later XS1100S Midnight Special. Maybe the lack of an illustrious predecessor was an advantage, because the clean, simply styled XJR was an undeniably good-looking machine. The 1188cc motor was placed in a new round-tube steel frame which, like the square-section FJ frame, incorporated a bolt-on lower rail to allow engine removal. Forks were conventional 43mm units, at the same time as at the back the XJR had a twosome of remote-reservoir shocks from Ohlins, the Swedish suspension professional firm owned by Yamaha. A pair of board 17-inch wheels, the front holding big 320mm front discs with four-piston calipers, completed a purposeful profile. Japanese riders were the first to discover this first-hand, as the XJR was introduced as a home-market bike in 1994, before being released elsewhere a year later. Most of those who rode it were impressed. Inevitably, the XJR1200 shared the limitations of every big naked bike, in that the exposed riding position soon made using the engine’s top-end performance tiring. Yamaha were the first company to put an alternative front end into mass production on a motorcycle, but they were by no means the first to experiment with replacing the front forks in favor of a better design. One of the pioneers of alternative front ends is Dutch ‘Specials” builder Nico Bakker, a man with several decades of chassis and suspension building to his credit and an impressive consultancy list that includes BMW and laverda. And his QCS1000 (QCS stands for Quick Change System, both wheels can be changed in a very short space of time) is the latest incarnation of his own very effective design. Traditional front forks are inherently flexible and can affect a motorcycle’s steering geometry as they compress in corners. A method of separating the steering from the front suspension is generally considered to be the way forward for motorcycle design, and as yet only Yamaha and BMW have put alternative front suspension systems into production. But Nico Bakker has a system which he has been using since 1998 which is both clever and effective. The QCS is a hand built ‘special’ that uses a Yamaha FZR1000 engine for its motive power, around which is wrapped an aluminium alloy square-section chassis onto which are bolted single-sided swingarms front and back. The front suspension system works in a very similar way on that Yamaha GTS1000 – the steering is handled via a spar running from the hub of the front wheel to the steering crown, while the suspension is actuated by the single-side swingarm that bolts onto the front of the chassis. The benefits of this system can best be realized by a high-performance sportsbike, which makes Yamaha’s decision to fit it to a modest-performance sports-tourer surprising. On the road the QCS delivers exactly what it promises. There is no front end drive when hard on the brakes, and the bike is rock-steady mid-turn. It exhibits none of the drawbacks of traditional front forks and, unlike the GTS1000, the steering response is both fast and positive. A massive front disc brake gripped by a six piston caliper helps stop this 160 mph beast, and a massive 180/55 section rear tyre helps the QCS tenaciously in the corners. The svelte bodywork and ‘unusual’ suspension system give the QCS a look all of its own – the swoopy styling and bright red paint tells the world that this is one serious, and very powerful, motorbike.